What a wonderful and easy tradition to start this 4th of July and it’s one the kids can help with! We’ve been making this flag cake for the past couple 4th’s and Mason loves helping. It’s extremely easy, very tasty, light on the tummy and very festive!! And all you need is “4 ingredients”, read below for the recipe. 1. Bake cake according to package, let completely cool. 2. While cake is cooling, prep all the berries and have ready. When cake is completely cooled, spread thawed cool whip evenly on cake. 3. And last step add the berries in a flag design, serve immediately or cover and place in fridge. This is a wonderful opportunity for your children to help you in the kitchen, they will especially love adding the berries(and eating them). To make it easier place the outline of the blueberries and tell them to fill in the square and add the first line of strawberries so they get a picture of what to do. The first time I ever made this cake I thought about it not being sweet enough and maybe adding frosting instead of cool whip. But nope, it was sweet enough but not too sweet. Just right! 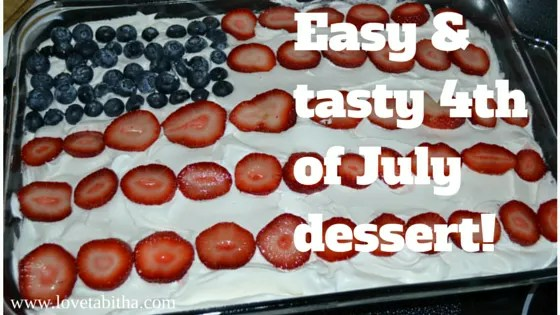 Perfect dessert for the 4th of July!